The Valley Shuttle: A regular bus on a regular schedule with a couple of exceptions. 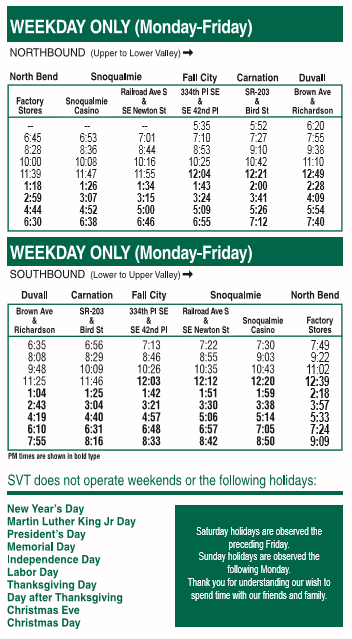 The Valley Shuttle connects riders to Metro bus stops between North Bend, Snoqualmie, Fall City, Carnation, and Duvall. The Valley Shuttle operates between 5:35 AM and 9:15 PM, Monday through Friday. No need to call if you want to take the Valley Shuttle from bus stop to bus stop. The buses look different than the normal SVT buses and are green and yellow with “Valley Shuttle”. To catch a Valley Shuttle bus to a destination, just stand at one of the many Metro bus stops. When the bus comes, tell the driver where you are heading just to make sure you aren’t getting on a northbound bus when you want a southbound bus! Get on the bus and pay your fare (the Valley Shuttle does not accept Orca cards). Use this service to take a trip up and down the Valley, explore new areas, or connect with Metro Routes to Issaquah, Bellevue, Redmond, or Seattle. 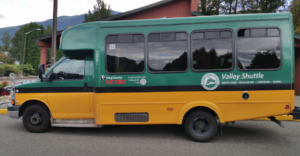 If you are in Duvall or North Bend and you need us to get the bus a bit closer to where you are at either end of the route, give us a call and SVT will try to arrange it. The Valley Shuttle has 10 to 15 minutes on either end of these routes to go outside the normal service and get the bus to an intersection nearer to you. For more info on Valley Shuttle click here!